Students pictured: Drew Gannon, Titus Howse, Lorie Bynum, Jamie Barber, Nick Eberle, Travis Baines, C.W. Alexander & Cody Lorance. 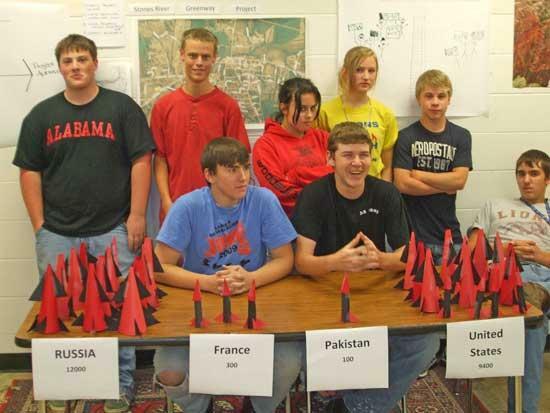 In coordination with the Nuclear Summit held in Washington, the Contemporary Issues class at Cannon County High School picked four countries to display a visual representation of the nuclear warheads. The countries were the United States, Russia, France and Pakistan. The large warhead represents 1000 warheads and the smaller represent 100. 1) Unlike 1960, our greatest concern is not from major countries, but from smaller, less secure counties where highly enriched uranium (HEU) could fall into the hands of terrorist or rogue nations. 2) HEU is located around the world at less secure sites. Securing these sites and this material should become the priority. 3) Larger countries should take the lead and agree to a systematic reduction of all nuclear warheads until they are eliminated. 4) Nuclear energy is considered green if all goes as planned. Handling nuclear waste, securing nuclear sites, natural disasters all add an element of risk to the nuclear process.